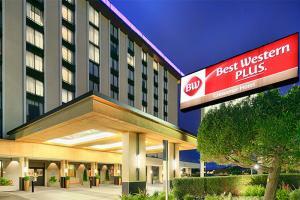 The Best Western Plus Grosvenor Hotel offers modern accommodations, outstanding amenities and a superb location offering easy access to San Francisco airport and the best of the city. Spacious guestrooms are equipped with plush bedding, flat screen TVs, and free Wi-Fi. Enjoy a delicious meal at the Brass Elephant Restaurant, which serves classic American cuisine and globally inspired flavors. Located 2 miles from San Francisco International Airport.